Family and friends of Jacob Norwood are raising money to pay for a wheelchair accessible van. As most of you know, we recently took part in a contest sponsored by NMEDA (National Mobility Equipment Dealers Association) for a new adapted van. Unfortunately, we weren’t one of the winning families but that won’t stop us! We have started fundraising with the assistance of HelpHOPELive and are committed to raising what we need to get a new van for Jacob. Jacob is an eleven year old boy with FOXG1 Syndrome, a rare genetic neurodevelopmental disorder with severe cognitive and physical delays. He is 1 of only 159 known cases of FOXG1 in the world. He is non-mobile and non-verbal, has a feeding tube, is legally blind, has frequent seizures and is missing brain tissue. He functions at the level of a 12 month old and relies on a wheelchair for mobility, as well as an assortment of other medical equipment for daily life. Jacob is our hero. Why is Jacob our hero? He is a silent teacher. He teaches patience, resilience, compassion, hope, flexibility, love, and so much more. 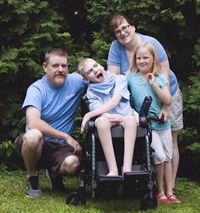 Not only has he inspired our community to raise funds for a wheelchair accessible swing at the town park, but he has also inspired us to join other families and start the International FOXG1 Foundation (www.foxg1.com) to help research the disorder. Jacob is a pleasure to be with; he is happy, loves to laugh, enjoys spending time with his parents and sister, and has even developed his own way of saying “I love you”. Jacob is pure joy. As of now, his travel is limited to school and medical appointments, since both provide wheelchair transportation. There are many things Jacob is missing out on, and an accommodating vehicle is not something our family can afford. A wheelchair accessible van would open up a new world for Jacob, which he could enjoy for years to come. That is where we can all help! A van can cost upwards of $50,000 and the we hope all of us can make this happen! Thanks to the incredible generosity of our community, the van has been ordered! We could not be more grateful to all of you! Love from Lucy and family! Hope you get your Van soon. Best of luck on this venture! Emma and Alli, fellow foxes from San Diego, are proud to help Jacob and family. We are the grandparents of Meredith (Fox G1), and are very honored to help support your son Jacob. Best of luck with the van. Thanks Rick, I will take a look at that! I urge you to look at the grants offered by Chive Charities. chivecharities.org They're an unbelievably generous community that stretches the globe. I wish all the luck to Jacob and his family! Jacob is an amazing young man with an incredible family! Such an inspiration! Sending a check tomorrow! I will also pass the word around the south shore.. Good luck! Good luck Team Norwood North! Team Norwood South has got your back and will spread the word. Jacob will be rolling in his new wheels in no time! This is a nationwide non-profit whose accounting is based in PA. We chose this organization so people would know anything they donated would be going for the sole purpose of a van. They also offer fundraising support that a gofundme/kickstarter campaign would not. This is great! Made our donation today and will share with all we can. Good luck!